It’s one thing to be in a community–to love a city, town or region. It’s magical, when a location first captures your imagination: it woos you, and you become compelled to start a business in the town. Then, it’s like love, when your new business becomes known, and you’re acknowledged on the street. This acknowledgement feels wonderful, ’cause it’s the sign that not only are you accepted in the community–but now, you’re actually identified with that place. This is all so grand: it’a delicious to be in a town that you love, that apparently, loves you back. Let’s take this relationship just one step further: while it’s terrif to be in a community, it’s another step forward when you become a contributing part of the community. This is what we’re striving to do, at The Brunswick at Saratoga Bed & Breakfast. Tom has been a member of horse racing media for decades. Being in Saratoga as a business owner now gives him, Kate and Renee the wonderful opportunity to give of themselves–to share the beauty and bounty of this lovely establishment. The beginning of our project is this: we’re turning over our towels, hand towels, washcloths, etc. as we cycle in new ones. 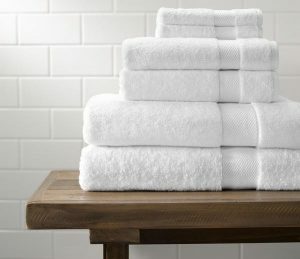 We’re donating our trove of luxe bath linens to B.E.S.T., the Backstretch Employees’ Assistance Program. B.E.S.T. operates at Aquaduct, Belmont and Saratoga, caring for the people who care for the horses. All our donations go to B.E.S.T. Saratoga, to be given to the wonderful people who work so hard, every day, to assure the health and welfare of beautiful Thoroughbreds. This seems like a good challenge, to toss out to other hostelries in the Saratoga region: while we will be giving many things during the next several years, B.E.S.T. and the hundreds of people they serve always can use more assistance. Perhaps other B&Bs, hotels, motels and lodges–may consider doing the same. Great idea! Wonder why no one’s thought of doing this before? Hope other establishments take on your example. All the best and good luck with your efforts!